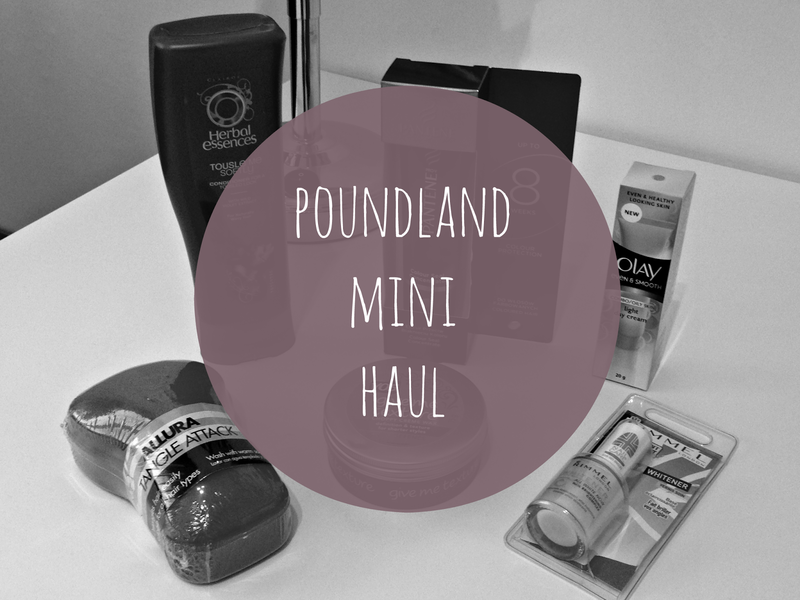 I love shopping in Poundland and although everything is a pound, I can still rack up quite a good bill at the end. 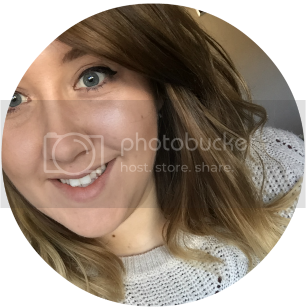 They're known for sometimes having hidden gems when it comes to make-up and beauty products and I like to pop it every now and then to see if they've had anything new! Lately I've not been too impressed as other beauty bloggers are constantly putting on how they've found a new Rimmel Apocalips lip lacquer or L'Oreal hair serum but every time I go to my local PS they aren't there! So gutting! Today was different though and I managed to grab a few things so I thought I would do a short haul to show off my finds! All girls know that frustration of finishing your conditioner before your shampoo and instead of buying a whole new bottle of conditioner, I just pop in Poundland and pick up these handy 200ml bottles of Herbal Essences to keep on hand just incase I do ever run out. I love their new range so I'm always more than likely to be using the brand anyway but it's always good to know you have a spare! Carrying on from hair, I also brought this Pantene Colour Seal Concentrate. When I first saw it I had no idea what it was as all the back instruction were in a foreign language but a bit of searching on Google, it seems to be a hair treatment that you can use once to week to keep your coloured hair looking amazing. Not bad sized tube for only £1! Out of hair for a bit and onto skin care. Olay is a brand my mom swears by and for as long as I can remember she's always used their beauty fluid so I knew it must be good. Because I suffer with oily skin I find I can never find any products suited for me but when I saw this even & smooth light day cream specially made for combo/oily skin, I definitely thought it was worth a go! Tangle teezer's are all the range at the moment but instead of splashing the cash on a real one, I brought this cheap little pink alternative for a small fraction of the price. I'm not sure how well it's going to be or how it will work on my hair but I'm going to stay optimistic until I try it. More hair and to be honest I have no idea why I brought this. I've recently cut my hair a few inches shorter so to try and get a bit more texture I was aiming for buying some sea salt spray or texturing paste but instead I brought this choppy crème wax for short hair. I know, WHY!? My plan was to rub a small amount into my hand and hopefully ruffle my hands through my hair to create a bit of texture. Good luck to me if that works. I'm a little disappointed with Poundland's make-up selection recently because to be honest, in my local store it's non-existent. I did however manage to find this Rimmel Nail Whitener hidden behind a few eyelash curlers. There are some days where I just cannot be bothered to paint my nails and I will normally go to work with either nothing or a quick layer of Rimmel's French Manicure in rose so I was hoping that this would be used in a similar way. This was actually a plant pot but I thought it was too adorable to put in the garden and used it as my make-up brush holder instead! They come in a few different colours but I went with pink, obviously! 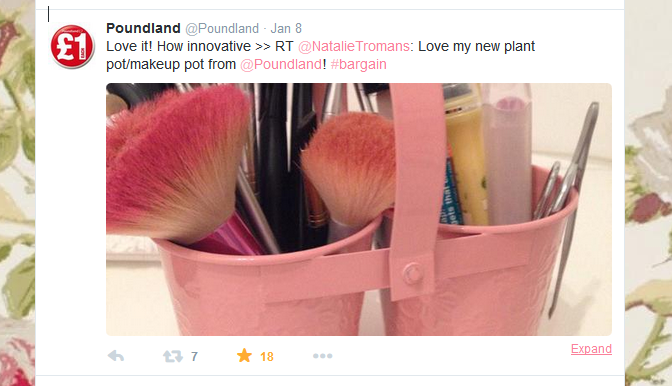 I even got a re-tweet from Poundland! Woo! I love the little brush holder! Its so cute and I love that it wasn't made for that because it shows how easy and interesting makeup storage can be! I'd be interested t see if that Tangle Teezer alternative is any good!